Confidentiality agreements are used to stop sensitive information becoming public knowledge. The agreement can last indefinitely, and if an agreement has been made then there can be legal consequences for the party that discloses the protected information. For many businesses and companies confidentiality agreements are used as a way of stopping competitors gaining important company information. When a new employee begins a job they will be informed whether or not they will have to sign a confidentiality agreement. Once this agreement has been made then the recipient of the information cannot disclose or use the information except as authorised by terms of the agreement. Confidentiality agreements are used to stop important or sensitive information reaching a public audience. Apart from commercial companies with product trade secrets there are many companies that will require their employees to sign a disclosure agreement. Government offices that hold sensitive personal details on members of the public can ask employees to sign these agreements. The agreement does not have to be written, and a verbal confidentiality agreement is as legally binding as a written one. Trade secrets are one of the reasons why companies will require employees to sign confidentiality agreements. Any successful company will want to keep their competitive business edge by stopping rival companies from gaining their business knowledge. Trade secrets are not simply just product manufacturing details; they can be anything from suppliers used, invoice information or customer details. A business that has taken years to build up and become successful will not want competitors to simply come along and steal or use information and business methods that have been fundamental to their own success. 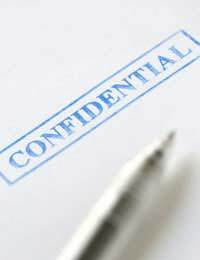 For businesses and companies there are a number of advantages to having a written contract of confidentiality. The agreement can set down clearly the terms and conditions of what is considered protected information, and the type of information that cannot be disclosed to the public. The confidentiality agreement can also be used if a dispute occurs over disclosure and legal action is to be taken against the person who has made the information available to the public. A temporary restriction on any further disclosure until a court hearing has occurred. A permanent injunction with damages awarded. Financial damages can be awarded on sales of a product that was disclosed. A court can also enforce the return of any disclosed documents. Information cannot be classed as confidential if it is already in the public domain. In some cases limited confidentiality may arise when only a certain section of the public knows of the information. The amount of information and the number of people that have knowledge of the information will be taken into account with disclosures disputes. The information held in a confidentiality agreement will vary from company to company, but there are certain points that should exist in all contracts. These should include the parties who have agreed to the contract, the information that is classed as confidential, and a definition of what the company regards as public domain. Also included in the agreement should be a time limit, if any, for the confidential agreement, remedies for any breach of contract, and provisions for confidential information disclosure by a third party. There may also be a statement informing the receipt that no patents or copyrights are being transferred to them. There will usually also be a clause stating that the company is not liable for any harm that arises to the recipient due to disclosure of the confidential information. Time Limits on Confidentiality AgreementsConfidentiality agreements can last indefinitely but it will depend on the type of information involved. For example, trade secrets agreements will still stand even if an employee has left the company. Minor commercial information will usually only last for the length of the employment period. There should also be a contract clause that states a deadline period for the return of all confidential materials and information once employment has ended.